Radio silence here attributable to book. It's going back to the editor on Tuesday, but I am going to Vienna tomorrow and the two things don't really match, so the past week has been intensive. Vienna is to be a wonderfully pianoy trip. That is roughly how he'd have looked when he first met Robert and Clara Schumann. As it's the wunderschönen Monat Mai, the sun's shining and the lilacs are coming out, and things are looking up a bit (London has roundly rejected the Tory party's racist mayoral campaign and elected Sadiq Khan, the first ethnic minority person to hold such high office in this country, with the biggest personal mandate in UK political history), here's Brahms's song 'Meine liebe ist grün' - My love is as green as the lilac tree. The words are by Felix Schumann - Robert and Clara's youngest son, born in 1854 when Schumann had already been hospitalised in Endenich. Felix died tragically young in 1879. 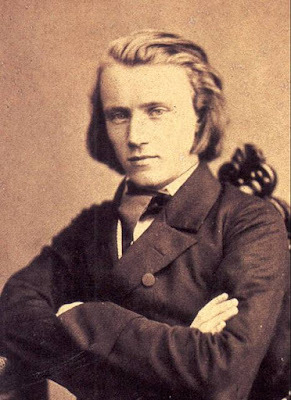 Brahms must have been virtually in loco parentis to him when he was born, and I don't think it's an exaggeration to say that there's a torrent of generous love in this music.